Shining throughout your space in more ways that one, this lavish lamp effortlessly embodies the perfect addition to your space. With an antiqued silver tone metal base and clean white faux silk shade, this perfect piece will surely radiate a sense of chic charm from room to room within any home decor. Maintaining faultless aspects of construction and fashioning a fusion of affordability and durable décor, this lively lamp is a prime example of impeccable artistry and design for your space. 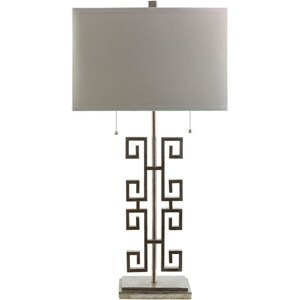 The Antony Antiqued Silvertone Glam Table Lamp by Surya at Hudson's Furniture in the Tampa, St Petersburg, Orlando, Ormond Beach & Sarasota Florida area. Product availability may vary. Contact us for the most current availability on this product. Browse other items in the Antony collection from Hudson's Furniture in the Tampa, St Petersburg, Orlando, Ormond Beach & Sarasota Florida area.